If there’s one thing Aston Martins are good at, it’s at being the sexiest cars on the road. One thing Astons aren’t so good at is carrying more than 2 people. You might be looking at the car above thinking it disproves that statement. You would be wrong. By most accounts, the Rapide is not what you want when you need to carry 4 adult-sized people someplace other than around the block. But when you can look so good failing at your only job, does it really matter? 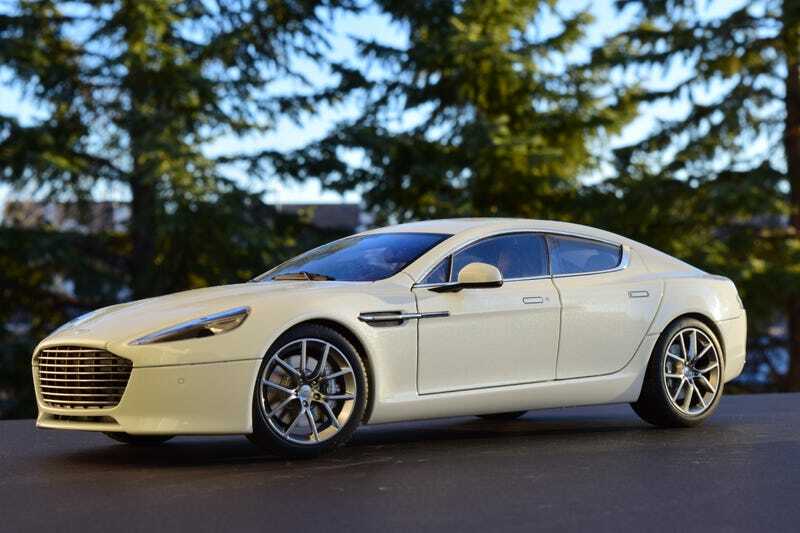 This Aston Martin Rapide S comes from AUTOart, and surprise, surprise, it is diecast, not composite. Don’t get your hopes up. AUTOart already made the Rapide, and going to the “S” model only required new wheels, grille and lower bumper, which conveniently was a separate piece from the main body. That body is resplendent in its pearl white paint, which has a gloss and luster that my plain white composite Vanquish can’t match. The Rapide also has an advantage under the hood, where you will find a completely separate engine. As ususal, the wheels are well done, but the brake discs deserve a special mention. Not only are they metal, they also have the scored look of a brake disc. Inside, AUTOart continues their love of black interiors for white cars. The center stack of the Rapide is spartan compared to it’s luxury sports sedan rivals, but AUTOart replicated it well, going so far as to even model the gear selector buttons in 3D. But the door panel controls are merely indicated by paint, and the seat controls that should be on the side of the console are not indicated at all. I’ve been recently trying to focus on clearing some of the “old-timers” off my want list, and the Rapide was one of those. I was able to get mine for $125, which is why it’s no longer on my list, but at the normal price of $150+, it would probably still be there.